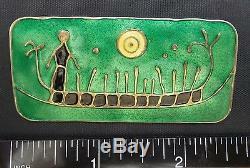 This is a very nice vintage sterling silver enamel pin by David Andersen of Norway. The pin measures 2 1/2 inches wide by 1 1/8 inches tall. It has beautiful green, yellow, and black guilloche enamel. The pin is sterling silver with a nice gold gilt overlay. It is signed ROCK CARVING FROM NORWAY, 1000 - 500 B. D-A NORWAY STERLING 925S MORA G. One tiny pintip bubble by the sun. The item "Vintage David Andersen Rock Carving From Norway Sterling Silver Enamel Pin Brooc" is in sale since Thursday, June 15, 2017.